We open with a very weird opening. A man in a forest collapses to his knees and clutches a woven doll in his blood hands. What the heck? We then cut to Yoshimoto Koya [Sakurai Sho] sitting silently across from Mrs. [Suzuki Honami] and Mr. Numata [Itao Itsuji]. Why is it so awkwardly quiet? It seems like everyone else is expecting the other party to speak. It is Numata Kazushige who is the first to finally break the silence. He complains that Koya has been sitting there for a long time and is not saying anything. It’s Mr. Numata’s long awaited vacation and they are taking the time to interview him, so why isn’t he talking? Koya only smiles. In runs Numata Shinichi [Kimiki Ryunosuke—I love this young actor!]. This shocks his parents. 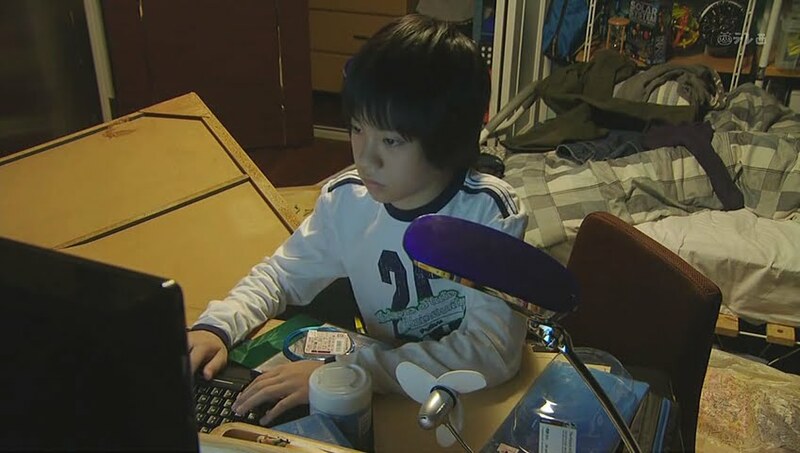 Isn’t he supposed to be in cram school? Shinichi replies that his cram school teacher said there was an accident and he had to hurry home. His parents are both fine? Koya finally gets up and opens his mouth. Did Shinichi run here from cram school? The boy replies he did. Koya smiles. Good. He goes to sit back down while the Numatas wonder who told such a lie. Koya confesses it was him. This is a family meeting and it cannot start until the family is complete. Numata Kayoko states it is not their eldest son that is the problem, but their second son, Shigeyuki [Uragami Seishuu]. Koya knows, but again, it’s a family interview—the entire family must be present. The annoyed Kazhushige then demands his wife hurry and bring Shigeyuki down so this thing can finally start. Kayoko goes up to to Shigeyuki’s room and asks him to greet the sensei [teacher], but the boy doesn’t make a move and Kayoko won’t force him to come down. Meanwhile, downstairs, Kazushige is praising his eldest son up. He’s going to the best school in the prefecture and is in the top 10 of his class. Shinichi tells his father to stop as it is embarrassing, but Kazushige goes on about how how good he is in athletics. Koya is surprised that Shinichi is so excellent as he thought he’d be a problem child. 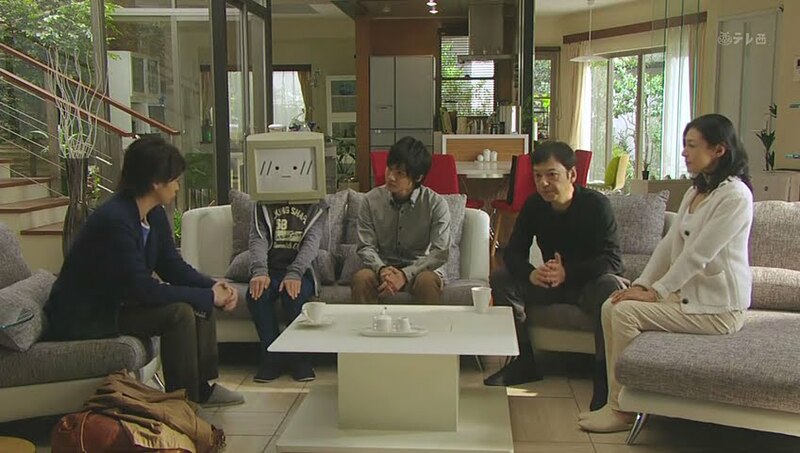 Kayoko comes downstairs leading a Shigeyuki who where a computer monitor for a head and walks like a robot. He even gives a robotic greeting. This annoys his father, but Koya says its fine as it doesn’t bother him. He goes over and invites the young boy to sit down. Shigeyuki does as he is told and keeps up his robot pretense. It is now time to start the family interview. Shinichi interrupts. Just what is this interview for? to assess if Shigeyuki is worth receiving Koya’s education. The phrasing surprises the Numatas. So…why did the Numata family contact him? Kayoko says she was searching for a tutor online when she stumbled on Koya’s homepage. Shigeyuki jumps up and gives the slogan of the homepage [Koya promises to get any kid into Toudai that he tutors]. This makes Shinichi smirk and Kazushige calls his youngest boy an idiot. The slogan was very catchy and thus she discussed it with her husband and they agreed to call Koya. Okay. Have they had any experience with tutors before? Yes. They’ve went through six already. As you can see Shigeyuki is very weird and very unlike his elder brother. Well, there’s obvious favoritism in this family. Koya then asks if there is a particular goal the family has. Yes. To have Shigeyuki pass the Seihoukan exams and get in to the same high school as his brother Shinichi. However, Kazushige believes this is impossible since Shigeyuki’s grades are in the bottom five and he has a habit of non attendance. In fact, he hasn’t gone to school since the initial two weeks after his third year started. Koya then asks why Shigeyuki no longer goes to school. His parents don’t know. Shinichi answers bullying and Shigeyuki refuses to comment. So…the goal is to get the kid back and school and raise his grades and get him into Seihoukan? That would be great if it were possible. Koya then gets up and takes the computer off Shigeyuki’s head. What is Shigeyuki’s goals? Does he want to raise his grades? Shigeyuki refuses to answer the question and only keeps repeating “Computer out of control.” Koya repeats the question and when Shigeyuki goes to repeat the same phrase, Koya slaps him. Shocking. Koya then moves the monitor and sits down next to the boy. He looks at him straight in the eyes and asks rather darkly if the boy wishes to raise his grades. The frightened boy nods and Koya agrees to take him on as his next student. Unorthodox indeed. Even in the US, this method is no longer permissible. The next day at work Kazushige discusses what happened with a coworker. Both are shocked by the slap. Kazushige still doesn’t know how he feels about that. Isn’t Koya expensive? That’s why Kazushige laid out some conditions. Since they don’t want to waste a lot of money, Kazushige gives Koya a week to get Shigeyuki back into school. If he succeeds, the gets 100,000 as a bonus. If he fails, he receives no money. Koya laughs. He doesn’t need a week. He only needs five days and the family cannot interfere with his methods. Kayoko is worried Koya will force him back with violence, but he assures her he won’t. We then learn that Kazuhige used to be in the sales department and has been moved to the human resource department. 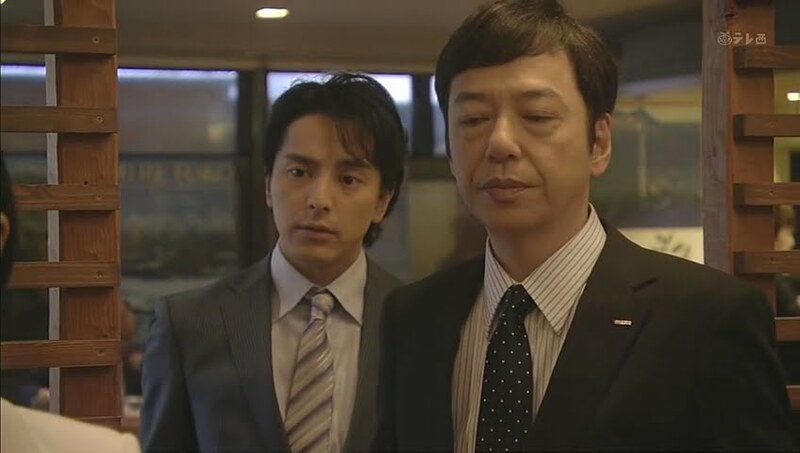 His friend asks why they are able to meet again after such a long time and Kazuhige delivers the bad news that his friend is on the list of names to be fired. How…tactless? Meanwhile, Kayoko is being invited to a stock seminar. The other women in the neighborhood wish her to join with them so it will be cheaper for everyone. the women then ask after Shigeyuki who hasn’t been in school for awhile. She lies and says his cold still is lingering. Enter Koya. Kayoko then introduces Koya as a home tutor and everyone assumes it must be for Shinichi. The two go into the house and Koya laughs at her lies. It’s hard to talk to her neighbors, isn’t it? He then asks what her younger son likes. She can’t answer. Koya says he will find out for himself and goes upstairs. He goes into Shigeyuki’s room and is greeted with party poppers. Koya asks if they should get started. Shigeyuki sits down at his desk and Koya looks around and snaps pictures of everything. He’s very invasive of the boy’s privacy which annoys Shigeyuki. Shouldn’t they get started? It’s okay since its only the first day. Koya then asks for more information about the only friend on Shigeyuki’s online diary. Sure thing. But first…a game. Koya smiles. Good. It’s nice to see the dark Sakurai back! I loved his darker role in The Quiz Show 2. Shinichi gets home and Kayoko has the table set so they can eat together since Kazushige is working late. Too bad her eldest son ate out. This crushes her. Shinichi then promises to eat it in the morning. No need. He proceeds to go upstairs where he is surprised to find his brother and Koya playing a game. He goes into his room and lays down on his bed. Koya finally leaves and bids the unhappy Kayoko goodbye. 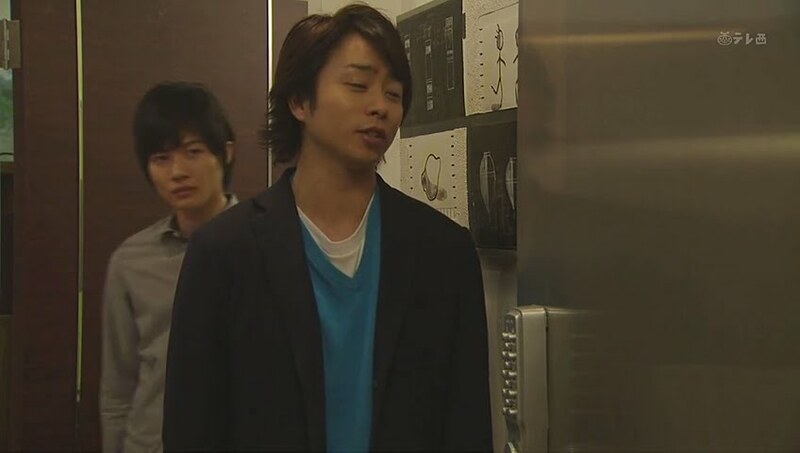 He then waits outside Kazushige’s office. What happened? Koya gets up and says that Kazushige needs to sign and stamp the home tutor contract. Kazushige tells him to be quiet as it is embarrassing and he quickly signs the contract without reading it. Koya gives him his copy and Kazushige invites him out to a drink which Koya refuses. Kazushige then leaves and Koya snaps pictures of him walking away. One brief pause to say the father really annoys me. How goes it with my idiot son? Sigh. With that type of attitude, no wonder your son is like he is. Shakes head. Neither parent knows anything about their children, do they? The next day dawns and Koya goes about snapping photographs of the family throughout the day. We end the stalking with Shinichi at school. Looks like he has a girlfriend. She asks about the new tutor and Shinichi calls him weird. He spent all day playing games with his little brother. Isn’t that good as it means they have a friendly rapport? Maybe, but if the tutor thinks he can get away with that, he has another think coming. 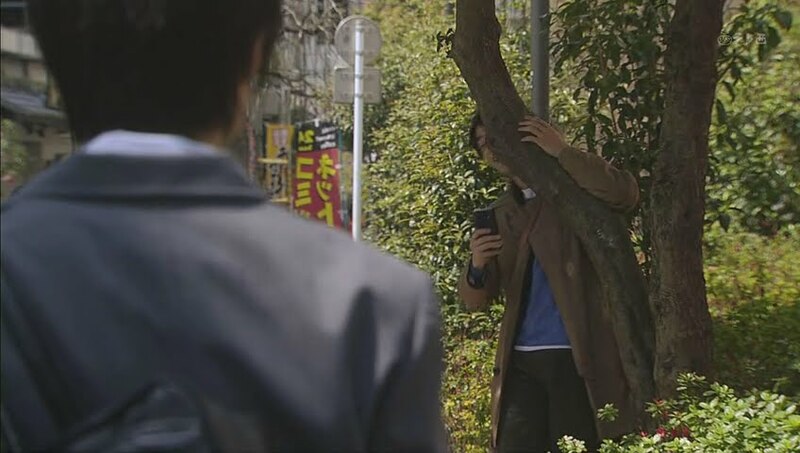 The girl gives him a peck on the mouth and rushes off and Shinichi turns in surprise to find Koya behind a tree smiling and taking pictures. The two are then seen running. Shinichi asks why and Koya says it is because he rarely gets a chance to do such a thing with a person at the national athlete level. Shinichi then asks what Koya meant at their first meeting about thinking that Shinichi would be a problem child. Koya does not respond and only runs faster. The two reach the Numata home and they compliment each others running. Koya then says that Shinichi lied. The other day when he said he came running from cram school when he heard his mother was seriously injured was a lie, right? Say what? It is 1km from the cram school to the house. A bus or taxi would be faster than running. 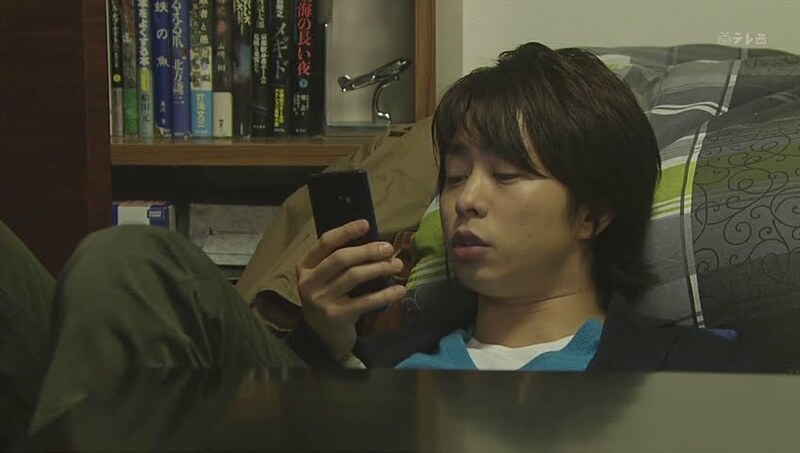 Plus, Koya called the cram school at 2:55 and Shinichi got home at 3:34. When that happened, Koya thought here is a boy who merely walked home when his mother was supposed to have been seriously injured. Well, the time is against Shinichi as is the fact he wasn’t sweaty or out of breath. So…Koya had him run to tease him? Koya looks up at the house. The whole neighborhood thinks the Numatas are the perfect family and the only thing stopping them from being one is the problem child Shigeyuki. That’s not true, however. The entire family has a serious flaw. Koya smiles while Shinichi shoots him an interesting stare. How exciting. Koya and Shinichi enter the house. When Koya tries to get into Shigeyuki’s room, the door is locked. Is the boy home? Shinichi replies he is, but won’t open the door. Shinichi then goes into his own room and Koya smiles once more. So Shigeyuki pretended to be good on the first day and is now doing this? “Good.” In the Quiz Show 2 Sakurai had a repeated phrase and it looks like he does so in this drama as well. Koya asks if Shigeyuki doesn’t want to play with him. He then says that if he can get Shigeyuki to school by Friday then Koya wins. If Shigeyuki doesn’t go to school then the boy wins. If that happens Koya will do one thing the boy asks. This gets Shigeyuki’s attention. Anything he asks? Right. So if he asks Koya to kill his classmates? Koya smirks. Of course. Shigeyuki tells him to remember the promise and Koya says the deal is sealed. Shinichi, who has been watching the entire time, wonders what Koya will do if Shigeyuki really asks him to kill his classmates. Koya then asks if Shinichi has cram school. That’s right. does Shinichi have the newspaper? While Shigeyuki is involved in his game, something goes over his window. Shigeyuki wins and turns on the light. He opens his window only to find a solid obstruction there. What? He then opens his bedroom door only to find a locked steel door behind it. Kayoko then comes home to find men working on the house. What is going on? Koya tells her this is reform. Shigeyuki demands to know what is going on. Koya explains he sealed all the exits to Shigeyuki’s room. Isn’t that great since he won’t be leaving? Of course not! But…it isn’t fair if Shigeyuki can freely enter and exit his room. This is the game they are playing. If Shigeyuki doesn’t like it, then he can give up and go back to school. Shigeyuki refuses—someone will let him out. Kayoko then hands her phone to Koya to have him explain to her husband what he’s doing. Koya takes the phone totally annoyed and acting slightly like a brat. Kazushige demands to know what he is doing. Koya then says that if they breach the contract then they owe him 10 million yen. Say what? Didn’t he read the contract? 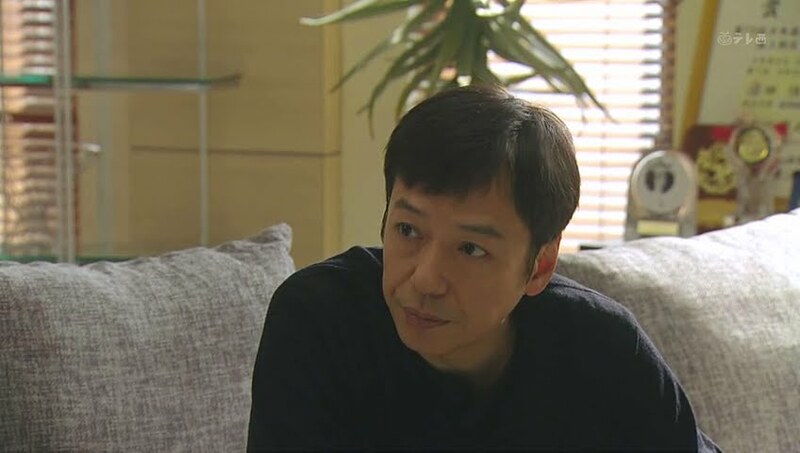 Kazushige excuses himself from his colleague and goes to check the contract. Sure enough. He says he’s at work and will talk to him later. He then goes back to his friend who wonders why Kazushige isn’t merely firing the out of bounds tutor when he’s doing it to him. Bitter. Koya goes downstairs and demands Kayoko make dinner while he’s there. This freaks her out since she had no prior notices. Koya then hands over the construction costs. Dinner is over and Koya goes to head home to watch anime when Kazushige comes home. He decides he agrees with the drastic measure until his wife hand him the construction bill. Kazushige then takes Koya into a sauna to talk. Kazushige bemoans the fact that he has to fire his friends. He used to work hard but lost all motivation after being transferred. During this time, Kazushige keeps trying to give the bill back to Koya who refuses it. The two then struggle over it. Silly. While they are fighting, Kayoko goes to Shigeyuki’s room to ask if he’s okay. Koya refuses to give her the code and if she tries to open it the alarm will sound and the security people will come which wouldn’t be good. Shigeyuki yells at her to leave him alone and die. Poor woman. Shigeyuki then starts feeling the urge to pee. His father then comes by and talks about how big a problem he’s creating. He tells him to win over Koya, but then says he’s just kidding and to quickly come out. The problem gets worse for young Shigeyuki. 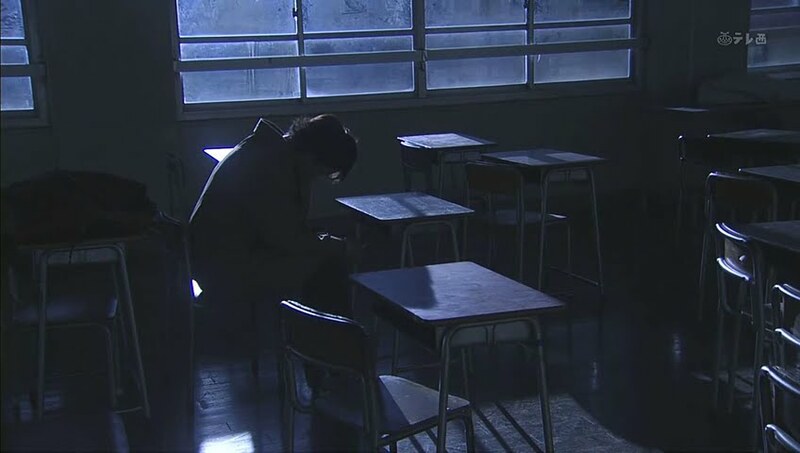 He bangs on his wall, but Shinichi is outside on the phone and doesn’t hear him. He then bangs on the door and yells for his mom who has headphones on. The boy gives up and finally urinates in his trash can. He then recalls the bullying that started when he supposed pooped his pants. Sono was the only person who talked to him or was nice to him after that incident. We then have a scene of Kazushige eating out with a colleague. The young woman in front of them lost her wallet and the cashier threatened to turn her over to the police. Kazushige steps in and pays her bill. She thanks him and promise to pay him back. Something is definitely afoot there. At the Numata house, Koya asks Shinichi about Sono. Shinichi remembers that boy used to come by all the time. Is Koya listening to him? Of course. He then asks if Shinichi knows Maeshima Ami. The gravure idol? Shigeyuki likes her a lot. 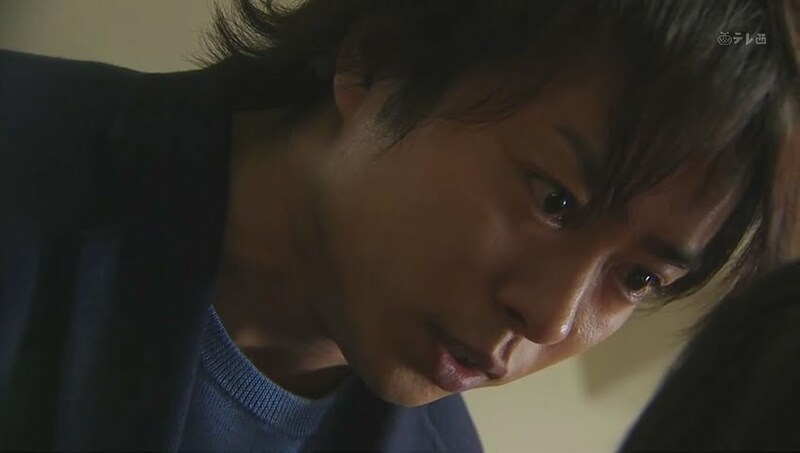 When he lost her photo book he came into Shinichi’s room to yell at him. Is he listening? LOL. Koya is such an interesting and unique person. Shinichi then asks if Koya is going to take Shigeyuki’s food home again like last time. Shinichi is aware he did that? Is it really okay not to give the boy any food? 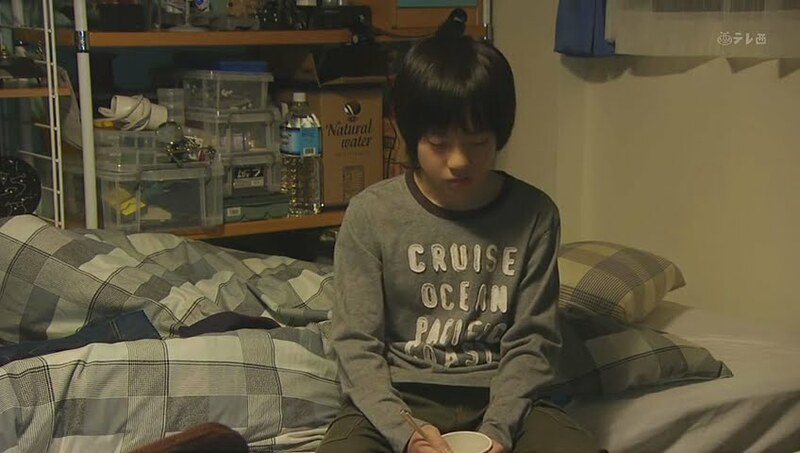 Don’t worry, he has cup ramen in his room. Well..they did expire a long time ago. That bit of news shocks Shinichi. Koya finishes packing up the food and says that Kayoko is strange. Normally she would bring the food directly to Shigeyuki, but not so. Then again, if things were normal, this game would not be allowed. Shinichi then says his parents don’t care about them even though they love to talk the children up. Koya then wonders if they’d be upset if Shigeyuki dies. this worries Shinichi. Koya lets out a loud burp, smiles, and leaves. What a weirdo. 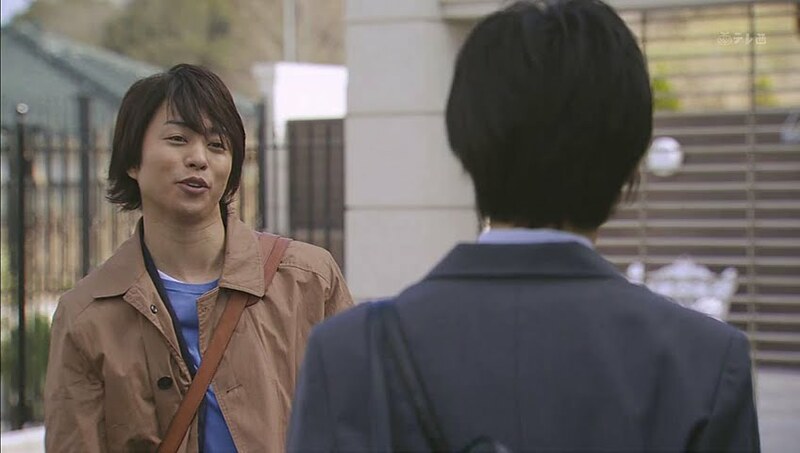 Koya then goes to visit Sonoda to talk about the bullying situation. Of course, Sono-chan turned on his friend to avoid becoming bullied and started bullying Shigeyuki as well. So…why did Sono approach the boy to begin with? Because he really liked Maeshima Ami, too! He even stole the photobook that Shigeyuki loved. Does Koya have proof? No, he’s not a detective after all, but Shigeyuki is aware that Sono did it. Koya then lays a guilt trip on Sono as the boy was Shigeyuki’s only friend. 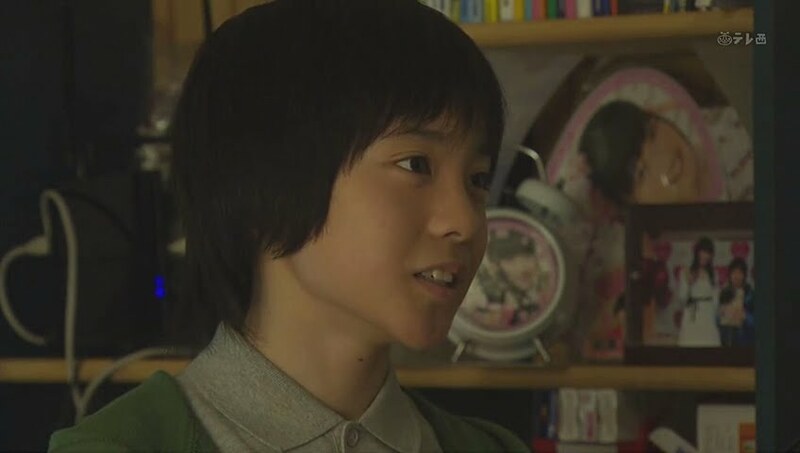 Koya then goes to the Numata house where he tells Shigeyuki he visited all 25 of his classmates. He wanted to know what they think about the boy. Koya begins reading off the replies and Shigeyuki goes ballistic. He starts throwing things and screaming at Koya to stop as all the comments were very negative or indifferent. When he gets to Sono, Koya says that Sono wishes for Shigeyuki’s return. Koya then leaves and promise to be back tomorrow. Shigeyuki says that Sono isn’t a friend and then looks around his trashed room. Koya goes to a school late at night and sits at a desk. I personally hate the sound of emphasized breathing which they do here. Koya loses control and starts trashing the classroom. What is going on? He then sits depressed in a corner recalling a young boy, the woods, the bloody hand and doll. Crazy. Just crazy. I know nothing about the book this is based off nor the original movie/special so I’m in the dark wondering just what happened in Koya’s past. The next day Shigeyuki’s expired ramen catches up with him. He bangs on the door demanding to be released. That means Koya wins, right? Kayoko comes up and asks what is going on. Koya says that the boy is at the age of rebellion. Shigeyuki demands to use the bathroom in his own house. Kayoko doesn’t like this and demands to the code to let her son out, but Koya refuses. She then threatens to call the police. Koya doesn’t care, but what will the neighbors think? This makes Kayoko stop. Shigeyuki then says he doesn’t want to think about it anymore. Just let him out. the boy is then silent. Koya asks if it came out. Shigeyuki says nothing and cries while his mother walks away. Koya calls her a bad mother and laughs. That night Shigeyuki sits on his bed and wonders why. He then gets a message from Sono saying he wanted to mail him, but didn’t know what to write. 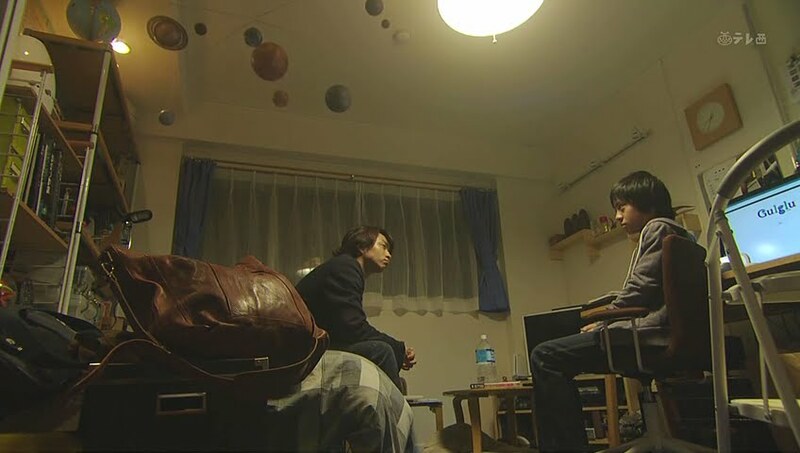 Meanwhile, Koya is hanging out in Shinichi’s room. The older brother asks if things are okay because tomorrow is the deadline. Koya doesn’t answer him and just prays for a miracle to happen. Shigeyuki, meanwhile, is not replying to Sono, but Sono doesn’t stop messaging him. He tells him that Koya when to visit him and told Sono that Shigeyuki knew that he stole the photobook, but still considered Sono his friend. Finally, Shigeyuki starts typing. He says that Sono betrayed him and we cut to scenes of Sono joining in and bullying him. Sono tells him he wishes to apologizes for many things. Sono confesses he got close to him only for the photobook, but he did enjoy hanging out with Shigeyuki. He had finally found a friend. Will Shige trust him one more time? Will he be his friend again? Koya then calls out to him. If Shigeyuki doesn’t leave his room, then tomorrow he will win the game. Before Koya is fired and leaves, he wishes to tell the boy one thing—there is hope that is why Shigeyuki should becomes stronger. Koya then says he’s unlocking the door. It’s up to Shigeyuki to make the final choice to either step out and move forward or stay in his room. Shigeyuki looks at Sono’s final message. What will he decide? The next morning Koya is eating breakfast at the Numata house and Kazushige says he failed. He then hands over the construction costs and the two squabble over the bill once more until Kayoko says Shigeyuki’s name and everyone turns to the stairs. There is Shigeyuki dressed and ready for school. Koya happily greets him. Shigeyuki says nothing more than he will be going. Kayoko then hand him his lunch. Koya shakes Kazushige’s hand—isn’t this great? Kazushige’s happiness is short-lived when he realizes Koya stuck the bill into his hand. LOL. Shigeyuki arrives at school and hesitates. Koya then comes up—leg cramp? Shigeyuki says now and then Koya grabs his face and squishes it together: “Don’t be burdened on your own. Okay? I’m on your side no matter what.” Such inspiring words and a sincere expression. What a jumbled character Koya is. Shigeyuki then turns and bravely heads into school. His arrival causes a commotion. He sits at his desk and greets Sono when he comes in. Sono ignores him. Shigeyuki goes up to him and smiles an thanks him for the other day. Looks like he lost. The other boys come over and Sono says he made a bet with Koya about whether or not he’d come to school. Sono then says that it was Koya messaging him, not Sono. The boys then start laughing at him. Poor boy. Koya is inside the house counting money with a smile. Shigeyuki comes in and demands to know why Koya did it. So he found out already? Of course! So why? Shigeyuki had closed his door, didn’t speak to anyone and hurt his own stomach to the point he shat himself. He’s always alone in a room full of garbage—doesn’t he want a friend? So it was all some stupid bet? Koya’s more evil side comes out. Shigeyuki plays too many games—there’s no messiah who will come to help. The young boy then tries to fight Koya who shoves him away. He then shoves him into glass shelves and tells him to get up. Kayoko comes in and demand to know what he’s doing. Koya tosses her away. Is it already over? He climbs on top of Shigeyuki and holds his face. Why isn’t he looking at him? Koya then begins making stabbing motions and pounding his fist into the floor. He demands that Shigeyuki not look away, not run away. Is the boy running away from him or reality. Shinichi comes down and Kayoko screams at him to stop Koya. 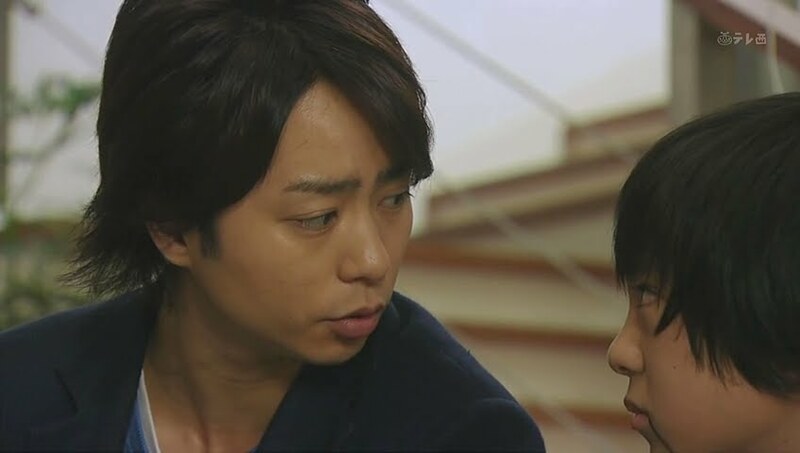 Shinichi grabs him and Koya turns and tells him to just admit he doesn’t care what happens to his little brother. He’ll feel better. Shinichi lets Koya go and the tutor laughs maniacally. He then picks up a megaphone and begins rattling off suicide news and other bad stories. In this world there is definitely a thing called hope, but you know, reality is definitely crueler than you think. That’s why you need to be stronger. Koya helps the boy up and says that if he goes to school for one week, Koya will quit as it means that Shigeyuki doesn’t need him. He picks up his bag and smiles—time fore lessons. Kazushige’s friend leaves and says that he will definitely make the company regret firing him. Kazushige then laughs and says that man won’t succeed anywhere. He leaves work where he runs into the pretty young woman. Meanwhile Kayoko stares at her phone and calls someone a hypocrite and Shinichi steals a magazine. Shigeyuki asks if Koya will really quit if he goes to school for a week. Correct. Then Shigeyuki vows to go. He then asks after the doll. Koya bends over and says he killed someone. Oy. What an ending to a very weird drama. I’m not sure if I like this or not…but it’s very different and beyond what I imagined. The first episode really freaked me out. It was too extreme for me. O_O”” It was nice seeing Kimiki Ryunosuke though! I still remember his character in SPEC, hehe! LOVED him in Spec 2!!! His character was all kinds of awesome. As for this series… I’m still processing it. I wasn’t expecting such a strong, dark element. I don’t quite know what to make of it yet. Yeah, it’s weird and in a twisted kinda way appealing! LOL if that makes sense at all. Just the kind of drama I would love to watch. I’m already addicted by the 2nd episode. 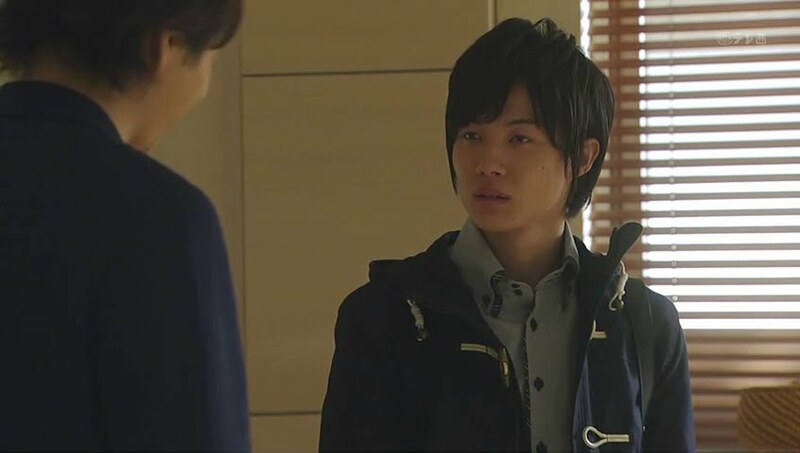 My preconception of Sho Sakurai’s inability to act is a bit of an adjustment, with Kamiki Ryunosuke also on the show – who is a tremendously talented young actor. 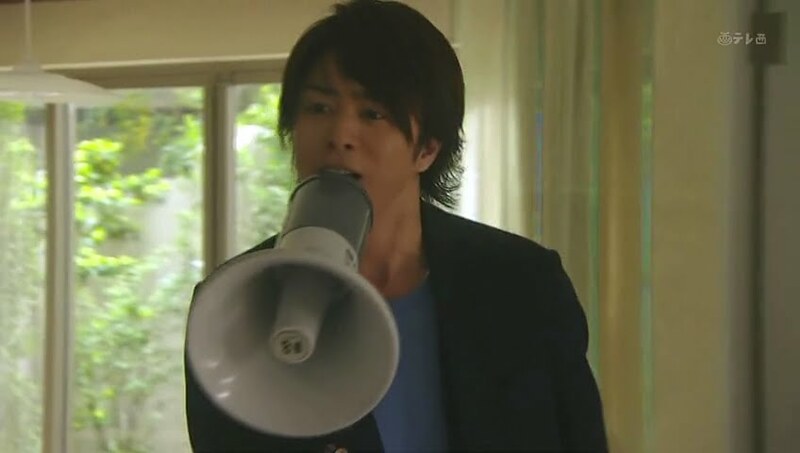 But Sho delivers quite a performance! I’m very impressed with the acting so far… the story keeps getting better and better! Yes, warped and twisted, but not in a bad way yet 😛 I haven’t managed to catch a minute to watch the 2nd episode. 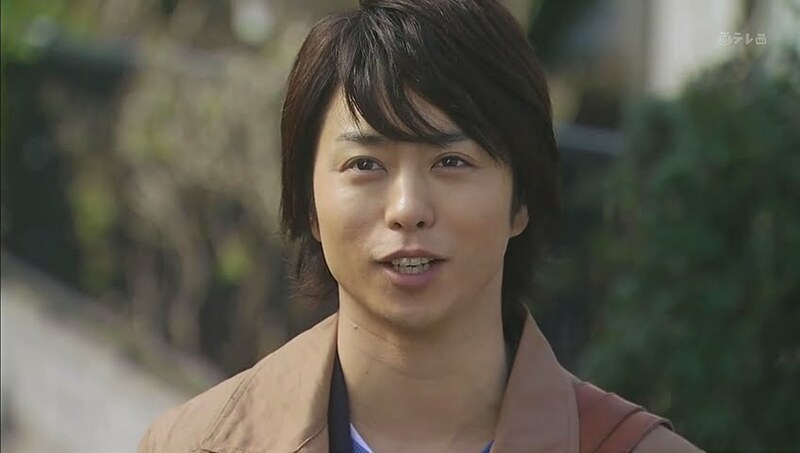 Sakurai Sho is probably a better host than actor at times, but he’s doing a good job in this show so far, especially considering he has been paired up with the amazing and young Kamiki Ryunosuke. I get vibes from when he played Kamiya or Kamiyama or something like that in Quiz Show 2 which I quite enjoyed. asdfghjk I just watched the episode. I don’t really expect much going into a drama, but I was kind of wowed by like everything. 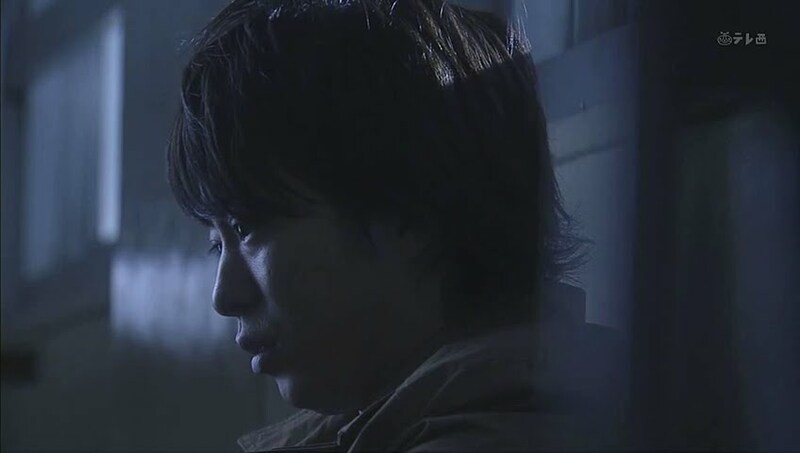 Sakurai Sho, I haven’t seen him in anything else, this is my first time seeing him and he’s really good. I didn’t know what to expect and am pleasantly surprised myself. 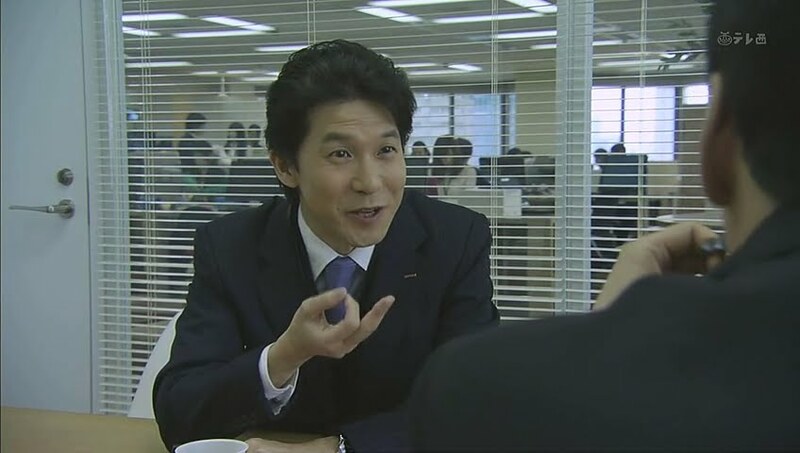 I recommend checking out Sakurai as Kamiyama in Quiz Show 2. The character is delightfully dark at times.